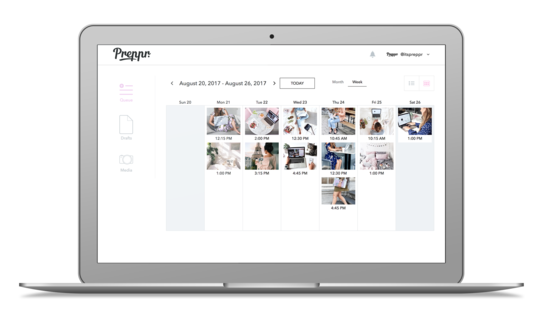 Preppr helps you to create & schedule content and draft captions days, weeks, or months in advance. You decide to automatically post your scheduled instagrams or that you prefer to manage the last steps of the posting process manually with a reminder from Preppr when it is time to do so. Whether you manage 1 or 50 Instagram accounts, Preppr helps you to handle your tasks simply from one dashboard. Arrange the look of your Instagram feed with our visual planning feature and look polished at all times. View your full Preppr posting history and easily repost your best and favorite posts with just a simple click. Timing is everything! Preppr recommends time slots to publish your content for maximized engagement. Store all your photo and video content in your media library on Preppr and easily identify which content has been used already in previous posts. Preppr doesn’t limit you. Schedule as many photos and videos as you like! The weekly and monthly calendar previews help you to quickly get an overview of your posting schedule. Store your favorite set of hashtags and captions and repeatedly use them without the need to re-enter them every time.